• Road: the east-west highway (Baku - Tbilisi - Poti/Batumi) and the north-south highway (Russia via Baku to Iran). 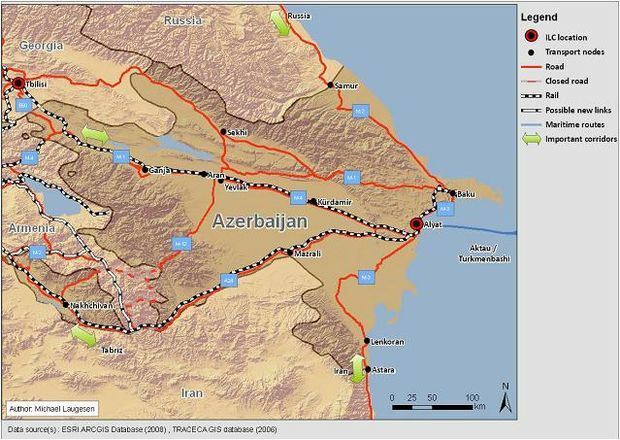 • Rail: the main railway to Georgia and the railway from Russia to Iran via Baku, Lenkaran and Astara, which cross at Alyat Station. Improved containarisation along TRACECA corridor, development of the new type transport and logistics services to increase attractiveness of the TRACECA route in terms of liability of transportation, reduction of travel times and costs. Development of the new businesses in transport sector, contribution to the port attractiveness as a central hub on the Caspian region and hence switch of cargo flows onto TRACECA corridor. Attraction of the logistics business to settle in the new facility – investment in warehouses, logistics facilities, supporting services, establishment of the value added services in the logistics centre. WB , EBRD , ADB.